ONE IN THREE CHILDREN ARE FITTED INCORRECTLY IN THEIR CAR SEAT! Home||ONE IN THREE CHILDREN ARE FITTED INCORRECTLY IN THEIR CAR SEAT! That’s 1:3 children at risk right now on our roads. We have said so many times that there’s no point in having a perfectly fitted child seat and a poorly fitted child! Sadly though, parents and carers seem to still be getting it wrong. We have been collating information from all our car seat checks for a long time now and when we looked into the details of mistakes people make, we were shocked! The seat would be wrong and the child will be fitted correctly? The child would be right but the seat will be wrong? Or…. The child and the seat will both be incorrectly fitted? Its worrying that although the messages are getting home about checking your seat fits your car and you get good advice and service from the people in the know. The important part we play in placing our children in the seats is being seriously neglected. Tip 1 Get the harness position correct on your child every time. In a forward facing seat, make sure the harness comes out from the back of the child seat just on or just above the childs shoulder. You shouldn’t have it any higher or lower than 2cm from the top of their shoulders. Check that any additional head cushions aren’t giving you a false impression of the harness position. In a rear facing seat, make sure the harness comes out from the back of the child seat just on or just below the childs shoulder. You shouldn’t have it so low that it comes from level with the childs shoulder blades. Again, check that any additional head cushions aren’t giving you a false impression of the harness position. Tip 2 Give them a Pinch! Once you have fastened the harness around your child and tightened it up, give the webbing a pinch, between your forefinger and thumb. If you cant pinch any harness then you have it correct – if you can, tighten the harness. Why is this vital? Children’s bones are so flexible and in a collision their bodies can be forced through the smallest space and if the harness isn’t tight enough they could come out of the harness and the seat, with unimaginable force. Tip 3 Baby its cold outside! Not only do coats add to babys overheating in car seats, they prevent the harness from working correctly. 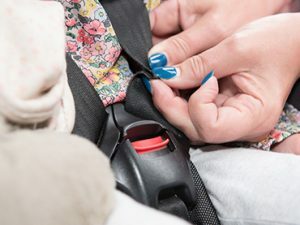 If you don’t believe us, try putting your little one in their seat with their coat on, tightening their harness and then repeat the process without the coat – you’ll see how much room there is for the child to squeeze through if a crash occurs. So remember – Only indoor clothes in the car! If your child is old enough and heavy enough to now use a Highbacked seat or a booster seat, its not time to take things easy. The seat is designed to act like an adult bone structure around their under developed bodies. Always use the seatbelt guide up by their shoulder – this is like an adult collar bone and guides the seatbelt correct across their chest and away from the neck and spine. Adjust the vehicle seat and head restraint to make the car seat fit correctly and therefore allowing the child to sit comfortably and safely. Tip 5 Growing up to soon! Don’t be tempted to put your child in the next stage seat just because they reach the minimum weight. Snug is good! So look instead at what the maximum weight is of the seat you have already invested in. Always check with the retailer you bought it from to see if your child’s body has outgrown their seat and don’t be surprised if they wont sell you a new seat just yet. In the same vain, don’t keep your child in a seat any longer than the maximum weight or height for that seat. The seat will have been crash tested with a crash test dummy of the maximum weight and height in it, but there is no guarantee it will work just as well when your child is bigger than this. No one doubts that car seats save lives, but so do the people fitting the precious cargo in them! Let’s get this right before it goes horribly wrong.